"SPIRIT DRUM" Drum Supply Cost. 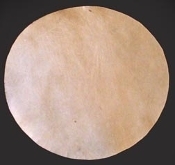 DEER HIDE DRUM SUPPLIES:$150 18" size; $130.00 for 15". Please note LIMITED QUANTITY AVAILABLE. This item is for SUPPLIES to create your own Spirit Drum. ORDER FOR WORKSHOP DRUM SUPPLIES AND ENROLLMENT CLOSES OCT 10TH. PLEASE NOTE: This is not for a finished drum, only supplies to make a drum. DEER MEDICINE:When we are working on the natural laws of circulation -- the circulatory system, the Heart -- then Deer is our Medicine. Many of us are taught to figure life out, and live in our heads with little attention to our hearts. We suffer from "poverty consciousness", the belief that there is just not enough time, money or love to go around. Deer opens the heart chakra, teaching us to trust and to empower the feminine quality of love and wisdom. Drumming with Deer reminds us that we live in an abundant universe with more than enough of everything. Deer helps us learn the laws of circulation -- when we feel unloved, it is time to love others and feel that love returned many fold.